An Axel Scheffler original illustration for £2! 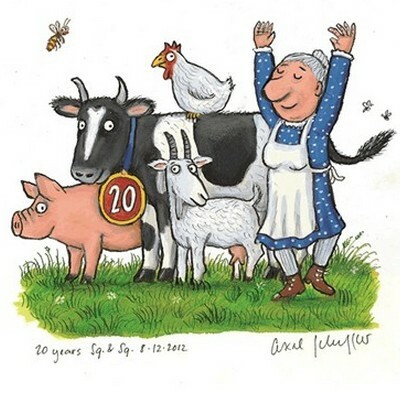 Yes, this wonderful illustration by the great and much-loved Axel Scheffler could be yours for just £2. But how?!? 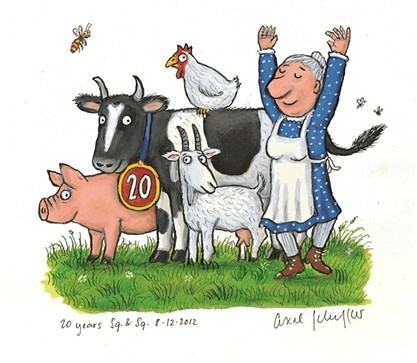 This year, Macmillan Children’s Books celebrates twenty years of publishing the no.1 best-selling picture book duo in the UK, Julia Donaldson and Axel Scheffler, a collaboration which started with A Squash and a Squeeze. This means that rather than go to the highest bidder, everyone gets a chance to win. Whether you decide to enter once or one hundred times is entirely up to you, of course! How to enter the raffle? Entrants (from the UK and Eire only) must pay a £2 entry fee to Farms for City Children through their MyDonate page . The raffle closes on Monday 3rd June 2013. Full details on entering can be found on Farms for City Children’s official website.